← Wearing, Sewing Neoprene–Yes? No? Maybe? I figure when a product hits the pages of WSJ, it has come of age and has the stamp of approval from the highest echelon of taste and respectability. Imagine my surprise to find the lowly sewing machine has made it, albeit an inside back page. The title, An Automated Stitch in Time Saves Nine, really has nothing to do with the article. Perhaps, some editor slapped it in the allotted space, just like some NYTimes Food Editor decided Grape Salad appeared on every Minnesota Thanksgiving table (turkey and wild rice were already taken). The article does note that dry cleaners will mend a popped seam and sew on buttons but apparently owning a sewing machine to sew on a button is a lot quicker than dropping off the garment at the corner laundry. But, hey, any publicity for sewing is good publicity, especially when it’s in the WSJ. 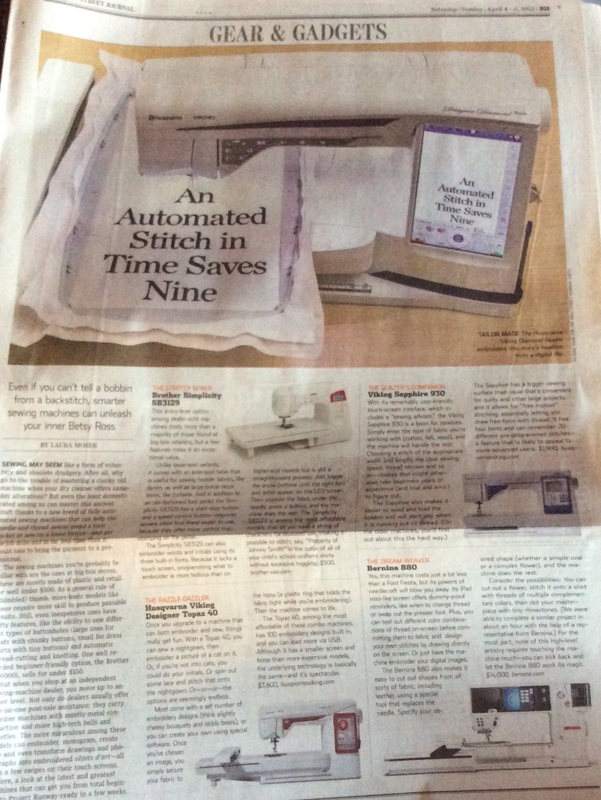 This entry was posted in OPINE and tagged Bernina, sewing machine, WSJ. Bookmark the permalink.